With the new cycle just weeks away, I (Cindy) thought I’d share a couple of resources that my family and I have used in conjunction with our past Shabbat Torah Studies. Setting family time aside each week to study Hebrew together, in conjunction with the Bible, is a wonderfully enriching experience. 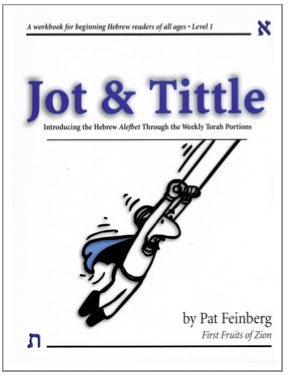 Jot & Tittle is for the beginning Hebrew ￼reader and introduces the Hebrew Alefbet in both block and cursive — and as a bonus — through the weekly Torah portions. You’ll learn the Torah portion name — what the name means and related words — and will get practice in both reading and writing Hebrew. Weekly lessons are just two pages long and take less than 30 minutes. At the completion of each book of the Torah you are given a fun review. Search the Sidra (which is another name for ‘Torah portion’) goes a bit deeper than Jot & Tittle by mining the weekly Torah portions for Hebrew nuggets. Each week includes the first verse of each Torah portion from which you’ll learn a little Hebrew vocabulary and even a bit of grammar. Each lesson includes a wordsearch, crossword puzzle, word matches, a scroll for you to search and even a little doodle for you to complete with the cursive Alefbet. 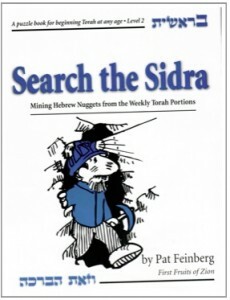 Search the Sidra takes a wee bit longer than Jot & Tittle with weekly lessons four pages long. Both workbooks can be found at First Fruits of Zion. *With both books I found that stripping off the cover and putting the pages in a binder made them easier for use.